I came across an interesting site with thought provoking analysis of exactly where witnesses may actually be pointing to in the immediate aftermath of Dr. King's assassination. Now there are rather a lot of annoying animated and blinking ads at the top. Scroll down. It gets better. 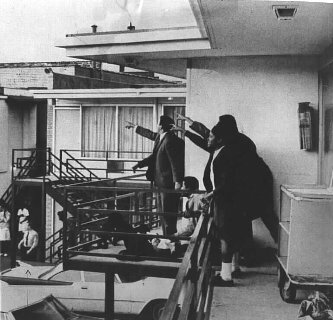 This iconic and haunting photo taken moments after Dr, King was shot shows Andrew Young and others pointing in the direction they believe the shot came from. But, what exactly are they pointing at? The federal government believes they are pointing at the back of Bessie Brewer's rooming house, from a window they say James Earl Ray shot from. Researcher Ted Wilburn believes they are pointing towards the Gattis building.